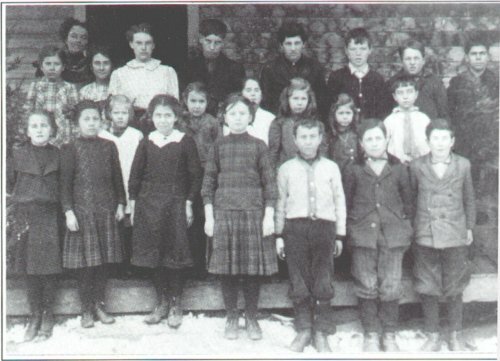 Copp Hollow School 1911. Marjorie Parsons, Doris Patterson, Emma Barden, Dorothy Rogers, Ted Muncaster, Morton Parsons, Ray Ford; 2nd row, Nelly Kelly, Bertha Wheeler, Vera Ford, Loretta Passmore, Lorena Passmore, and Merton Clemons; 3rd Row, Gace Kelly, Eva Ford, Edith Davis, Doyle English, Johnny Stevenson, Paul Dike, Sexton Parsons, (?) Borden; and teacher Eva Clemens.